Do you want a change from glasses? Are you sporty and find that your spectacles get in the way of your performance? Perhaps you simply want a new look? Gone are the limitations posed by old contact lenses. Today, with so many different types – made from various materials – you can say goodbye to uncomfortable, time consuming options and hello to the freedom modern contact lenses offer. Lenses are available in ‘daily’, ‘weekly’, ‘monthly’ or ‘durable’ varieties, so you can choose the option that best suits you. 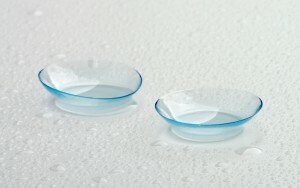 Dailies are often ideal for people who wear contact lenses infrequently, so that they can be worn and then disposed of. Alternatively, longer-term lenses can be cleaned and reused up to their maximum allowance. Two-weekly lenses are also an option, providing an intermediate stage between the weekly and monthly varieties. You will also be able to choose continual wear lenses if you wish; these are designed to be worn 24 hours a day for one month. If you don’t wish to handle the lenses there are monthly appointments available with our optometrist Ian, so that he can remove the old lenses and insert new ones for you. Contact lenses can be soft (made of flexible silicone hydrogel) or rigid gas permeable types – all varieties allow oxygen to reach the surface of your eye. Some are designed to last 12 months but the exact longevity depends on the type of lens in question and how often it is worn. Speciality, bespoke, multifocal and coloured lenses are also available, so if you fancy a fun change of eye colour or have a complex prescription, we offer a huge range of lenses in practice. Please contact us for a quote for your requirements. If you are new to contact lenses or looking to change the type of lens you wear, you will be offered a soft trial set of lenses, FREE OF CHARGE, to ensure they are right for your eyes. Our experienced optometrist Ian Carr performs lens assessments by checking your eyes and prescription, taking measurements and then guiding you through the fitting and cleaning processes. Once you are set up with your new lenses, you are strongly advised to return for an aftercare appointment every 12 months, so that we can check that your eyes are healthy and the lenses are still suitable for you. In addition, we supply a variety of contact lens solutions suitable for all lens types, as well as a range of eye bags, gels and drops which can be used in combination with the lenses for maximum comfort. For more information about contact lenses, or to make an appointment for an initial assessment, please give us a call on 01744 23955..